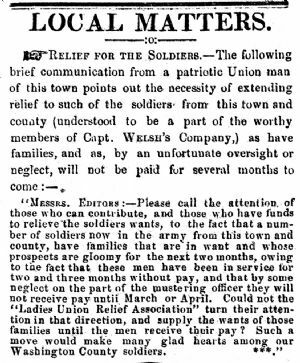 "MESSRS. EDITORS—Please Call the attention, of those who can contribute and those who have funds to relieve the soldiers wants, to the fact that a number of soldiers now in the army from this town and county, have families that are in want and whose prospects are gloomy for the next two months, owing to the fact that these men have been in service for two and three months without pay, and that by some neglect on the part of the mustering officer they will not receive pay until March or April. Could not the "Ladies Union Relief Association" turn their attention in that direction, and supply the wants of those families until the men receive their pay? Such a move would make many glad hearts among our Washington County soldiers. ***."